Michelle Obama seems to be having the time of her life this summer. The former first lady was spotted dancing with Tina Knowles Lawson at the Paris stop of Beyoncé and Jay-Z's "On The Run II" tour on July 15, and Obama was spotted dancing again at the Maryland show on Saturday. The second time around, she wasn't with Lawson; she was with her husband, former POTUS Barack Obama. 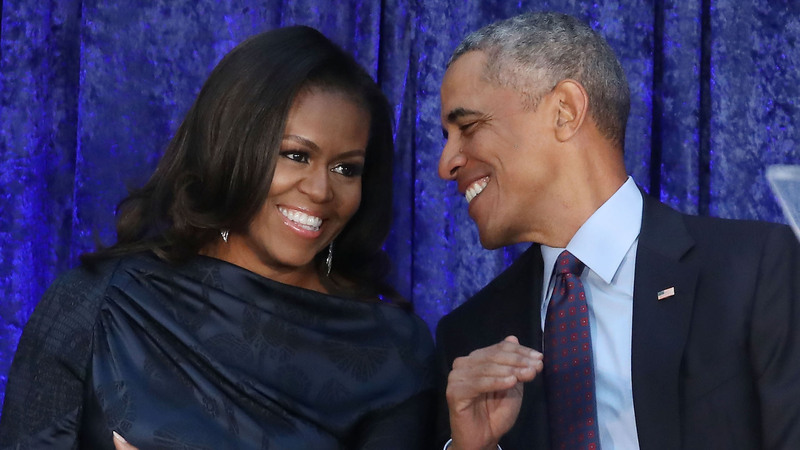 As reported by People magazine, one fan shared a video of the Obamas on their Instagram dancing with their hands in the air during the concert. It's hard to decipher what song is playing because there's so much going on in the audience, but the Obamas look like they're having a great time. Who wouldn't? The Carters are legendary performers. The Obamas and the Carters have a long history together, per People. Beyoncé performed the Etta James classic "At Last" at the former president's first inauguration in 2008, and she and Michelle Obama paired up for the Let's Move campaign targeted at childhood obesity. The former first lady also appeared onstage with Beyoncé at the Global Citizen Festival in 2015. In 2014 and 2015, she took her daughters to Beyoncé and Jay-Z shows. The fan Twitter account Beyoncé Legion shared the video of Michelle Obama and Lawson dancing at the Paris "On the Run II" stop just hours after France won the 2018 World Cup. Now that the tour is stateside, it makes sense that she'd go again and bring her husband to join the fun. We're just a little jealous that she's gotten to see the Carters live so many times.